Aquamaps (2013) Reviewed Native Distribution Map for Thryssa hamiltonii (modelled 2100 map based on IPCC A1B emissions scenario) (Hamilton’s thryssa). 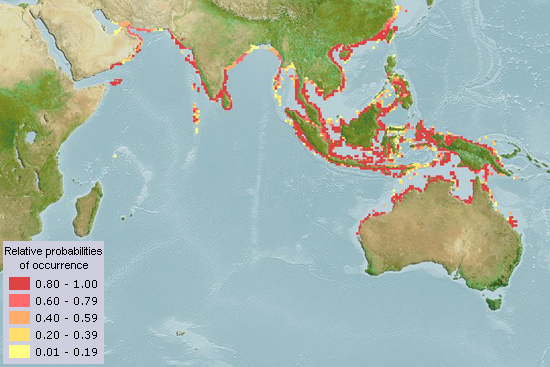 www.aquamaps.org, version of Aug. 2013. Web. Accessed 2 May. 2014. Arthur JR and Ahmed ABA (2002) Checklist of the parasites of fishes of Bangladesh. FAO Fish. Tech. Paper (T369/1), 77 p.
Day F (1958) The Fishes of India: being a Natural History of the fishes known to inhabit the seas and freshwater of India., Burma and Ceylon. Reproduced in 1958 by William Dowson andSons, London. 625 p.
Eol (2014) Thryssa hamiltonii: Hamilton’s Thryssa. Encyclopedia of Life. Retrieved on May 04, 2014. Fishbase (2014) Species Summary: Thryssa hamiltonii Gray, 1835. Hamilton’s thryssa. Retrieved on May 04, 2014. Gray JE (1835) Illustrations of Indian zoology; chiefly selected from the collection of Major-General Hardwicke, F.R.S., 20 parts in 2 vols. Illustrations of Indian zoology; chiefly selected from the collection of Major-General Hardwicke, F.R.S., Pls. 1-202. Rahman AKA (1989) Freshwater Fishes of Bangladesh, 1st edition, Zoological Society of Bangladesh, Department of Zoology, University of Dhaka, Dhaka-1000, pp. 245-246. Rahman AKA (2005) Freshwater Fishes of Bangladesh, 2nd edition, Zoological Society of Bangladesh, Department of Zoology, University of Dhaka, Dhaka-1000, pp. 269-270. Shafi M and Quddus MMA (2003) Bangopshagorer Matsho Shampad (in bengali), Kabir Publication, Dhaka, Bangladesh, p. 145. Visited 216 times, 1 visits today | Have any fisheries relevant question?